The LP-380 provides brilliant piano sound in a low-profile, slim design. The flat-top cabinet looks stylish even when the key cover is closed. The high-output amplifier and speakers accurately reproduce a realistic piano sound, while Korg's flagship RH3 keybed enables expressive performances. 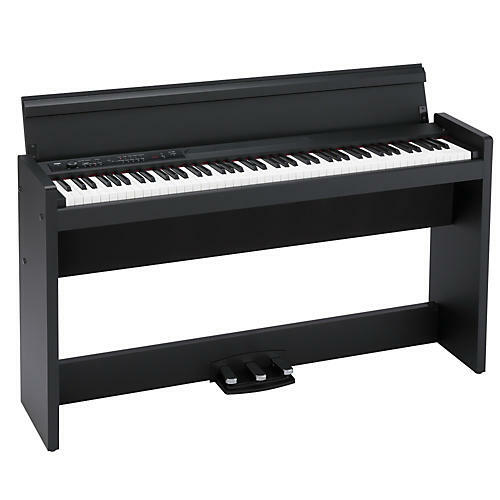 The LP-380 is a digital piano that's designed with a style to match your interior decor. Merely 26 cm in depth, it's slim enough to fit anywhere. The wooden key cover is flat on top, allowing the instrument to blend elegantly into your room when you're not playing it. Keeping safety in mind, the cover uses a soft landing mechanism to ensure that it closes gently. The slim and stylish chassis projects a sense of stability. The RH3 keyboard, three pedals, and large-diameter speakers ensure a superb piano-playing experience and rich piano sound. Choose from two colors to match the atmosphere of your room: black or white.